Do not make leveling up crafting in a realm reborn any harder than it has to be! Use these extremely helpful tips, and you’ll find yourself at 50 in no time! And start making money from FFXIV’s Marketplace! If you somehow got to this page, but you’re rather new or haven’t crafted yet, you should try reading our General Crafting Guide & FAQ first. Make no mistake, 99% of the ways you’re going to get crafting exp is, you guessed it, crafting. Maximizing each craft is probably the most important tip when leveling crafting classes in FFXIV. In ARR, gaining crafting exp and levels comes through the successful synthesis of items. However, you can try to squeeze as much EXP out of a single item each time you craft. (Often granting +200% bonuses and more!) How do you do it? By attempting for a high quality item each time. Take a look at these two examples. 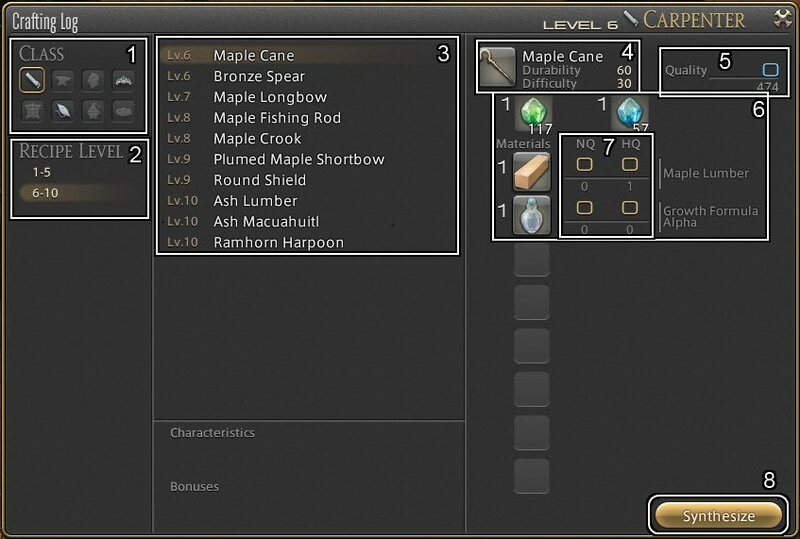 The above example shows crafting two of the same items, “Ash Lumber”. One was quickly crafted without attempting to for high quality, which only got 298 experience. 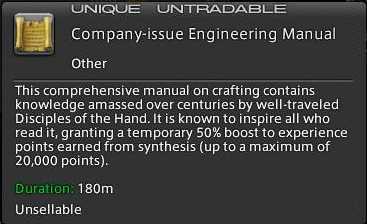 The second example, while it did not yield a high quality ash lumber, the resulting craft gained a bonus +233% exp. So when you’re crafting, always try to reach the highest quality percent possible, since crafting in a Realm Reborn seems to reward “effort”. Completing every entry in your crafting log is the next logical step WHILE maximizing each craft. Completing your crafting log gives a chunky exp bonus. Do not sell or throw away the stuff you crafted just yet! Some items you craft will eventually be asked for to fulfill Tradecraft Levequests, or Grand Company Supply Missions. Which is discussed below. As we all know, Levequest allowances are pretty valuable. Spending them on craft leveling is one of the better ways to use them in FFXIV ARR. Tradecraft Levequests are issued through any Levemete. They also come in different difficulties, every batch increasing by 5 levels. You cannot undertake Tradecraft Levequests in groups. You simply need to give an item you crafted (or obtained through other means) Check out the picture below. If you submit a high quality item, the reward is tripled(+200% bonus). This is why completing your crafting log (being ready with the required stuff) and maximizing each craft really helps you pile up on the exp down the line. At level 20, repeatable Tradecraft Levequests become unlocked. You are required to submit (usually) 3 of an item, and this can be done thrice. Submitting HQ also works with this, resulting in a massive amount of EXP. Repeatable or not, Levequests are currently the best method of gaining DoH levels quickly. In A realm Reborn, Grand companies can help you level up your crafting class in two ways. Grand Company Supply Missions, and Company-issue Engineering Manuals. Grand company deliver missions are always running, and are accessed from the personnel officer of your grand company. 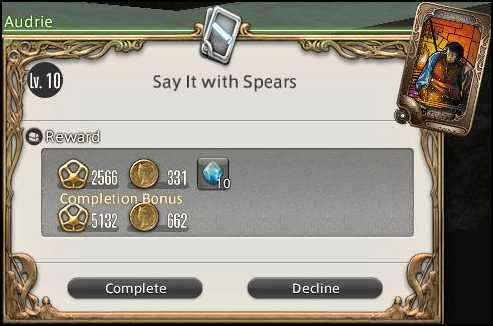 Aside from being great ways to earn grand company seals, they are also great ways to gain crafting exp. You can also see this from your respective Grand Company Leve officer. The interface is pretty self-explanatory. On the first column you have requested item (and what crafting class it comes from). The “Requested” column indicates how many times you can submit this mini-quest. It also shows you how many seals and exp to be granted to the respected crafting class upon turning it in. “Quantity” is how many of the item you currently own. As far as I can see, it never asks for an item far above your crafting capability. You should always be trying to fulfill this, It’s basically 8 free leve allowances. Company-issue Engineering Manuals are bought from your respective grand company. The item description pictured below. The item is pretty useful, as you can see. It boosts EXP gained from crafting by 50%, up to a specified cap. There are more powerful manuals available the higher your rank is in your Grand Company. The downside is, these things cost Grand Company seals. But if you did the supply missions above, you shouldn’t be in a shortage of seals. Which is another reason you should really be doing supply missions. There is a higher level one available, but I wouldn’t recommend using either past level 20~. 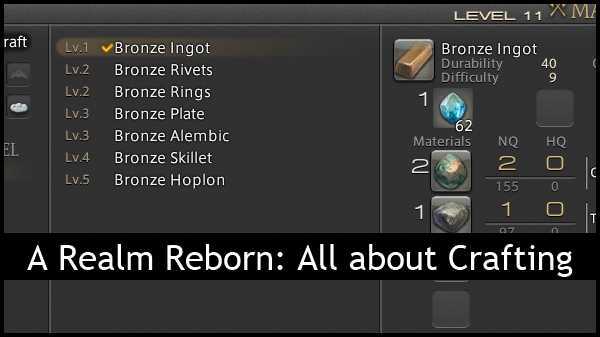 Everything you need to know about crafting in FFXIV! From becoming one, to leveling up to 50, you’ll find the info you need right here. 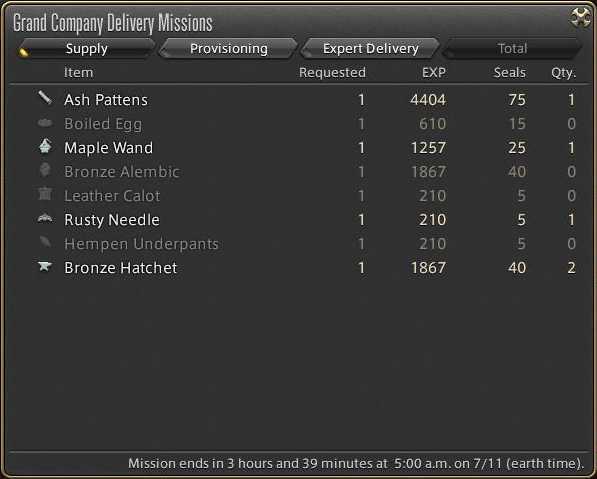 So you wanna be a crafter in a realm reborn ey? Well you came to the right place! Everything you need to know about crafting is found right here! How do I become a crafter? Once you pass your level 10 story quest, you can gain different jobs and classes. Crafting classes are no exception. Basically, just like choosing any class for the first time, any Disciple of Hand class you pick up starts at level 1, and you begin the cycle of leveling up yet again. Luckily, crafting is fun (for us at least) and we found out some great tips to make leveling as quick and easy as possible. Also, just like any combat class, you can switch into any Disciple of Hand class by changing your mainhand weapon. “I already know the basics to crafting! I want to know how to level up fast!“, Don’t worry, we have a crafting leveling guide right here. Where are the crafting guilds? Talking to the guild receptionist in any guild should point you to the guildmaster. Who gives you a small task (Quest) to begin your career as a crafter! You can access your item recipes through your crafting log. As pictured below. Your crafting log acts a lot like your hunting log, which is different for each Disciple of Hand class you have. Similarly, completing an entry in your crafting log grants bonus EXP. More on this later. Once you select an item you want to craft and press “Synthesize”, you will be brought to what we like to call the crafting mini-game interface. But first, here’s a small explanation of the different things found in the crafting UI. You can easily choose which crafting class you wish to use/level with this little selector. “Recipe Level” shows you the recipes you have, sorted by levels, depending on what crafting class you selected above. Clicking on the level selector now populates this field with the different recipes you have of the selected level. This shows you a preview of how much durability the item starts with. Durability determines how many steps you can take “working” the item before you fail or succeed. Also you can see the items base “difficulty” to craft. By selecting High quality base materials, you can increase the amount of quality the item has even BEFORE you begin crafting. This makes high quality base materials very valuable. Here you can see the various materials you need to begin crafting. Pretty self-explanatory. These little boxes give you the choice whether you wish to use a No Quality or High Quality base material. Clicking on this begins the actual crafting process. Pictured below. Shows you what item you’re crafting. Shows you how many times you have ‘worked’ this craft. Shows current / max amount of durability. Durability goes down by 10 (normally) for every time you work the item. When it reaches zero, and the progress bar isn’t full – you fail the craft. Material condition indicates how ‘responsive’ the current step is when trying to add quality. Normal grants no bonus, Perfect gives a huge bonus to quality if successful, and Poor material states should be avoided by waiting, or by adding synthesis. Shows you the current ‘completion’ level of the item you’re trying to craft. Adding to this bar is based on your Craftsmanship stat. Indicated how much ‘quality’ the item has. Note that there is no middle-ground. Either the item comes out as normal or high quality. You do not need 100% to get a HQ item. The higher the bar goes, the better chance you have in obtaining a HQ item (see the box above which says “HQ 2%”). You can increase this before you even start crafting by adding HQ base materials. Adding to this bar is based on your Control stat. Cancels your current crafting attempt. Disciple of Hand classes currently do not have traits, but they do have skills. Many skills are shared among all Crafting / Disciple of Hand. Below are a table of skills shared between all crafting classes. Masters Mend 7 94 CP Restores item durability by 30. Steady Hand 9 22 CP Improves action success rate by 20% for the next five steps. Inner Quiet 11 18 CP Grants a bonus to control with every increase in Quality. Observe 13 12 CP Do nothing for one step. Standard Touch 18 38 CP Increases Quality. Great Strides 21 32 CP Doubles the efficiency of the next touch action. Effect Active for the next three steps. Masters Mend II 28 150 CP Restores item durability by 60. Standard Synthesis 33 15 CP Increases Progress. Advanced Touch 37 52 CP Increases Quality. Each class currently offer three unique crafting skills, all learned at level 15, 25 and 43. Descriptions and discussions of these skills are found on their respective pages. Just like combat classes, crafting classes also have class-specific quests. They seem to come every 5 levels as far as we could gather. Doing these give you a free equipment upgrade, as well as some important skills to be unlocked for your class. Usually, they also “send you on the right direction” if you feel lost about what to craft, or what kind of materials you need. Yes, you need gear to craft too. Crafting level isn’t the only thing to consider when trying to craft higher level stuff. Crafting gear plays a big part in increasing your crafting stats. The different crafting classes each have a unique Main and Off-hand weapon (Tools). For example, equipping a Saw makes you a carpenter, and it’s unique offhand tool is a Claw Hammer. Obtaining the much sought after high-quality items will be nearly impossible without a great set of crafting gear. We will be making a guide on that too, soon enough! You can check out our Crafting leveling guide, for tips on how to gain EXP fast. Hurry up and be well on your way to 50!